Reliable and easy to use Baby Monitor for iPhone, iPad and iPod Touch, that works with any available network. TappyTaps has announced their new application, Baby Monitor 3G. This application is a tool for helping parents with babysitting. It uses two iOS devices - one stays in the baby’s room, and the other goes with the parents. Any noise from the baby’s room is recorded on the device, and is automatically sent to the parent’s station. “There are many Wi-Fi-based Baby Monitors in the AppStore, but none of them works particularly well. In addition, being limited to Wi-Fi only is a big weakness of these applications, and as parents ourselves we know this only too well”, said Jindrich Sarson, father of three and CEO of TappyTaps. Therefore, the TappyTaps team decided to revisit all the ideal features of the Baby Monitor and implement them into the Baby Monitor 3G. you can hear your baby - thanks to our state-of-the-art algorithm for voice and microphone volume adjustment you can hear your baby even when it is not close to the device or when it is crying softly. it is reliable – it constantly monitors the connection between the parent’s station and the baby station, and notifies the parents immediately when something goes wrong. It will even reconnect to another network should the first network drop. it works with any network (3G, CDMA, Wi-Fi, ...). You are no longer limited to just one Wi-Fi network, as with all the other Wi-Fi-based Baby Monitors available in the AppStore. Each device can connect to another network with no limitations on distance. it is network-efficient – we are well aware of the tight restrictions of some network operators, so one hour of typical use of this device requires only 1 MB of data, which is less than is needed to send one high quality photograph by e-mail. it is easy to use – easy to configure and even easier to use. “3G network support is a truly useful feature. I was staying in a mountain hotel last week and as usual that the Wi-Fi coverage in the rooms was good, but less than operational downstairs in the restaurant. However, thanks to 3G network support, I could have dinner with my wife with complete peace of mind”, said Sarson. iOS 4.3 or above. It will even work on the older iPhone 3G. 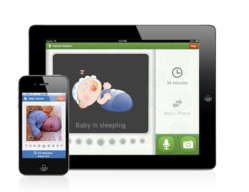 Baby Monitor 3G is a universal application suitable for both iPhone & iPad. Baby Monitor 3G for iOS is available at the introductory price of $3.99, and is available worldwide exclusively through the App Store in the Lifestyle category. Even though two devices are necessary to use this application, the customer only needs to buy one application – Baby Monitor 3G is installed on all the customer's devices or the customer can use iTunes Home Sharing to run the application on up to 5 devices. Review copies are available on request.